Looks like it's a wristbanded event... Buy the DVD the day of this event at Barnes and Noble beginning at 9am and receive a wristband, you are then grouped alphabetically to determine your place in the queue. Stevie will sign up to two copies of In Your Dreams per wristbanded guest. CD's or DVD's ONLY! The DVD will be released on December 3rd (US and Canada) and is priced at $14.99 at AmazonUS, Amazon Canada and currently $10.69 at Barnes and Noble This is a single disc issue at 112 minutes long and doesn't look like any of the videos produced for the album are included with this release - which is a shame! Nor does it indicate whether a blu-ray version is available. The Limited Edition Deluxe DVD Bundle is currently sold out... Only 1,000 copies were made available via Warner Bros.
WB has the standard version of the DVD without the bonus material available on their website for pre-order at $18.99. If you are outside the USA/Canada, this looks like your only option at the moment to buy. Warner Bros.
Be prepared to wait in line all day from 9am till 7pm and get about 2 seconds to get the DVD signed. I want to go so bad, I am a huge Stevie fan and have been for 30 years since I was 15. But, with health issues probably won't be able to. 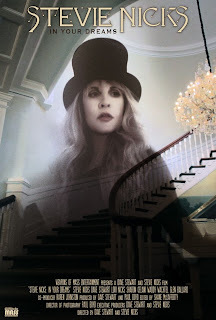 I wonder if Stevie remembers Christine's late mother telling Christine "It will happen at The Grove'' when Christine was wondering if Fleetwood Mac would find success in America. Stevie and Lindsey lived on Orange Grove right in the Fairfax district when they first met Fleetwood Mac, in walking distance from where this dvd signing will be held. I'm so glad it's coming on dvd- wonder if any retailer will do a cd-dvd combo, maybe with alternate mixes of songs on the cd, or if it will be the dvd only. Very exciting! "It will happen at the Grove''- if Stevie still remembers how Christine's mom predicted the big success, maybe SN has high hopes for the dvd. So glad that a physical copy is being sold- at last! Christine's Mother's exact words to her before she died was that SHE would find her fortune "in the California orange grove". Christine found her fortune. But, perhaps their is a reason it is being held here. Stevie please come on the east coast how bout boston this time for the signing.Then you can visit Vincent and family again while you are in Boston. Hopefully I bribed you into coming. Keeping my fingers crossed. OK I really want to go! :-) Do you plan on doing this anywhere closer to me, like New Orleans??? Or how bout las vegas at the convention hall near strip during your visit there new years week. I will be there then for fm show. If its still on. Get well soon John my prayers are with you. It would be good to have a DVD plus extras - videos, interviews - not just the movie. Market a package rather than just a DVD with a movie that has already been sold through online sites. I'm more than excited!! I'm bouncing off the walls. I am TOO excited! Just requested the day off from work! Great excuse for a quick trip to LA. Never thought I'd have the opportunity to be in her presence (other than at the concerts, of course)... I'm sure I'll be speechless and make a fool of myself, but whatever. I'll order it of course, but I'd rather pay for the deluxe version for $34.99 through Reprise. I'm still very irritated that the remainder of the music videos aren't being made available, which is a waste. They're already filmed, already produced, and just sitting there. A standalone release isn't going to sell very well without the extras. Dave Stewart confirmed to me on his Facebook that 8 full-length, fully produced music vids were made. We've got "Secret Love," "For What It's Worth," "Cheaper Than Free," and "Moonlight." We're missing the full vids for "Wide Sargasso Sea," "Everybody Loves You," "Annabel Lee," and the EPIC LOOKING "Italian Summer." My question is: why spend a ton of money and only so us the sizzlers of the videos? Why not put ALL the videos out on their own DVD like Annie Lennox did with "Diva" - and call it something like "Back To Your Dreams" or something snazzy like that. Has someone asked Dave about it? I see that Virgil Films is no longer the distributor, instead the film has now been passed on to Warner/Reprise (her label) - I'm sure they'll do nothing new to it. I hope they at least remaster the terrible audio in places. When I met her at the B&N signing in NY a few years ago, she was so sweet and nice to me it was worth everything to be there. Before she signed she took both my hands and talked to me a little and was very personal. QUICK, but personal. I waited about 11 hours on line - no wristbands at that one and it was worth every minute I waited. It was just so special. If you can do it, go. FYI - they told us she would only sign the new DVD/CD and security would not let her sign anything else for anyone except the new DVD/CD. They weren't kidding. I was hoping so much that she would be just as special as I always hoped and she really was. I was excited to hear that the...IYD ...documentary was finally going to be released on DVD, but not so much anymore aside from the fact that it was mentioned that it was going to be released in November...now a month later, and after two years, the videos are not going to be part of this documentary....what a waste...doesn't make any since at all. Stevie's fans have waited all this time for this documentary and for what...it will feel incomplete without the videos...and it probably will not sell as many copies ...thanks Dave for getting our hopes up , for what has turned out to be a major disappointment....why did you even bother making the documentary!!! Dave just should have kept his mouth shut about the videos. In reference to my earlier post ... if you pre-order from Reprise you get the digital photos as soon as you provide your credit card to pre-order. However, I now kind of wish I didn't have them because there are quite a few photos from scenes from the "Wide Sargasso Sea" music video that make me want the missing videos all the more. UGH. WHY DID I KNOW ABOUT THE DELUX DVD?!! BUMMER. ^MplsMike... Great suggestion.. I would have been happy with the videos included with the DVD to give it something extra, over and above the downloaded version...But the $10 price point on Amazon for the single DVD is a great price and she should sell a lot given it's so cheap, given it's the season for buying with Black Friday ahead, Xmas and all that jazz... If it was me deciding, I would have the doc., some "making of footage" from the 4 videos shot (cause it looks like they filmed everything behind the scenes and probably the days the videos were shot), the 4 videos included (or more, if there are actually completed versions of other videos)... AND I'd have thrown in the CD as well to boost the distribution of the music for which this was the whole purpose... That would have been a well rounded package I think. Yes the Wiltern show would have been great to see too... but I could live without it. I would have liked a full on all encompassing package to sum up the whole IYD experience. Even if they did a super package as a limited edition and sold it direct through Warners... But by Limited, I mean more than 500... If she could sell 500 with extra photos, signature and a letter at $35 in under an hour, I'm sure they could move a couple thousand at roughly the same price or slightly more with a couple more discs - maybe. I don't know the cost of putting these things together, but by selling it directly from Warners, you reduce your distribution costs dramatically just by doing that. The preorder has been changed to 1000 - it's available for sale again! ^^Nickslive ... I agree. Other than documentary the whole point of an IYD experience would be to reinvigorate the distribution of the music. Imagine all the extra photos ... I miss the days of CD booklets with not only lyrics but lots of photos. It is also possible this is a "dry run" to gauge interest. I feel like I'm beating a dead horse by continuing to mention the unreleased finished music videos, but perhaps if this does well she'll go ahead and release those to iTunes since the first four were released to iTunes. I wish I could go to the signing. I unfortunately live near Boston. I wish she didn't do all her signings in NY. Maybe someday she'll come to Boston. One can hope. You get a wrist band at 9 and then come back later. You don't wait in line all day.